RFoF Multi-Link Series w/ Redundancy. Ideal for Satellite Applications. RFOptic is a leading provider of multi-links as well as standalone links RFoF solutions. 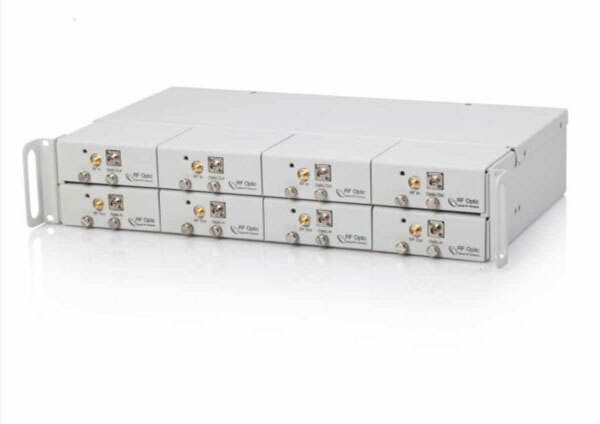 The analog multi-link RFoF solutions are designed to help customers deploy multi-channel solutions. This multi-link RFoF solution is flexible enough to accommodate any number of RFoF links, typically between 2 to 8 links in a single enclosure. A multi-link solution comprises of two enclosures: One enclosure housing the receive modules and the other the transmit modules. In case bidirectional support is needed, each enclosure can house both Tx and Rx modules. RFOptic provides a variety of rack mountable and outdoor enclosures based on the customer’s needs. Typically, the transmit modules are housed in the outdoor enclosure near the antenna and the receive modules are housed in a 1U chassis situated inside the control room. The rack mountable chassis consists of a 19” 1U and can house up to 8 modules (Tx or Rx). It has SMA and FC/APC or SC/APC optical connectors and can be customized based on the customer’s needs. View events/alarms, and manage / control the status of each individual Tx and Rx module. Troubleshoot by measuring the optical level and perform end-to-end RF tests.